Dominate the competition with the most powerful gaming audio controller ever designed for eSports – the TURTLE BEACH ELITE PRO T.A.C. 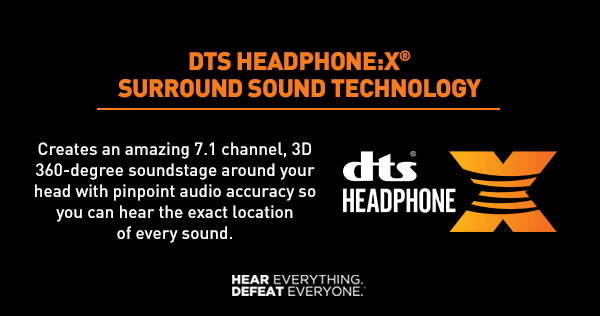 Offering amplified audio and cutting-edge technologies like DTS Headphone:X 7.1 Surround Sound and Superhuman Hearing, along with Turtle Beach’s powerful chat and microphone tuning tools, the ELITE PRO T.A.C. gives you everything you need to win. 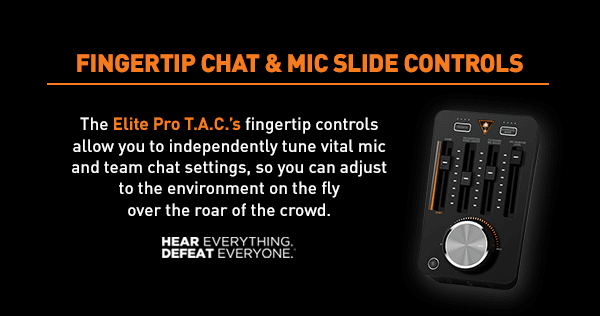 The ELITE PRO T.A.C.’s fingertip controls allow you to independently tune vital mic and team chat settings, so you can adjust settings to the environment on the fly as the roar of the crowd builds. Whether in a tournament arena or practicing at home, you can eliminate unwanted background distractions with tunable levels on your microphone. Your team will thank you. Your opponents will envy you. Ensure your voice is heard loud and clear by your team over the roar of the crowd. 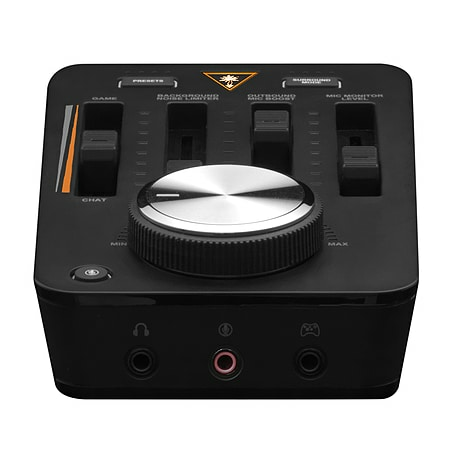 Creates an amazing, 3D 360-degree sound stage with pinpoint audio accuracy so you can hear the exact location of every sound. Custom sound modes combine with enhanced, genre-specific EQ audio presets to further immerse you in your favorite games, movies and music. Easily daisy chain multiple ELITE PRO T.A.C.s together using standard Ethernet cables to instantly create a seamless, lag-free closed chat network so you can team-up with friends and teammates and take on all challengers at LAN events and tournaments. Broadcast gameplay and chat streams in real-time to further immerse fans in your team’s entire competitive experience. 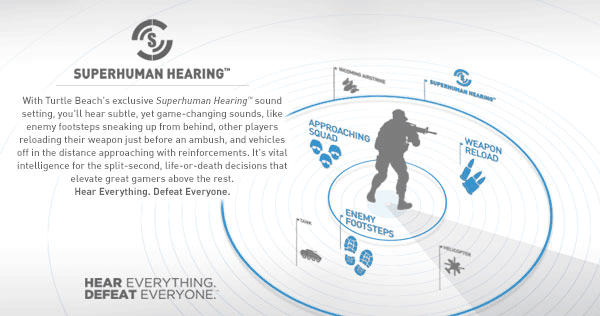 With Turtle Beach's exclusive Superhuman Hearing sound setting, you'll have the competitive advantage by being able to hear all the subtle yet game-changing sounds, like enemy footsteps sneaking up on your six, other players reloading their weapon for an ambush, and vehicles off in the distance approaching with reinforcements. It's vital intelligence for the split-second, life-or-death decisions that elevate great gamers above the rest. Hear everything, defeat everyone! 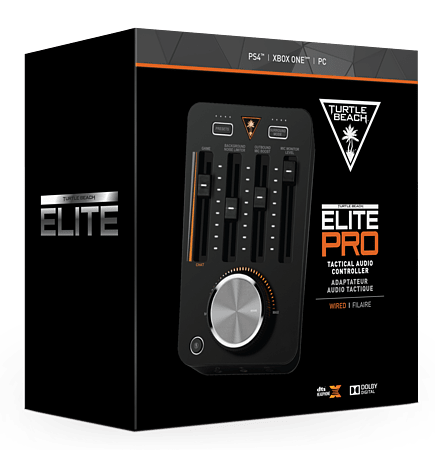 For gamers on PC and Mac, the ELITE PRO T.A.C. 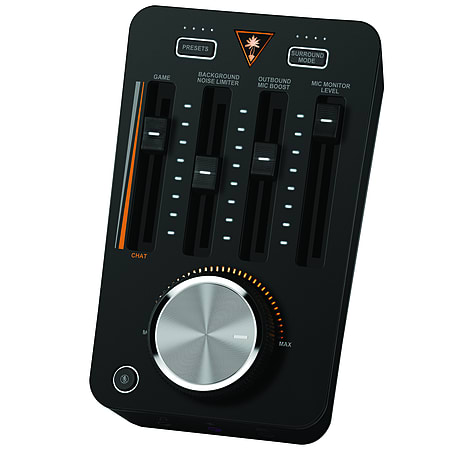 also serves as a full, external USB sound card offering DTS Headphone:X® 7.1 Surround Sound. 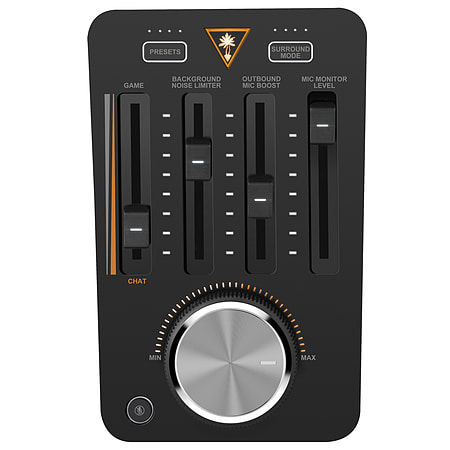 The ELITE PRO T.A.C. works great with the original PS4 (2013) and the new PS4 Pro (2016). For the new, slimmer PS4 (2016) without the Optical jack, if your TV permits, you can connect the Optical cable from the ELITE PRO T.A.C. to the Optical Out on the back of your TV to enjoy all the features of the Audio Controller. Visit www.turtlebeach.com/ps4compatibility for full details.